A number of my still life food paintings, tulip paintings and general still life paintings are commissioned by private clients. I love to work with clients who wish to commission a painting, as it means I can work closely with the client to decide on the subject matter, size of painting and where they plan to hang it. The finished painting often contains something very personal. I also work with art consultants and interior designers. If you have a space within your kitchen, dining room, library or other space where you would like to have a unique Dutch still life painting to admire, or if you wish to make a gift to a loved one please contact me to discuss how I can help. Subject matter, size, surface (support) and ‘feel’ of the painting are discussed after which I prepare sketches for review and feedback. Once the design has been approved, a 30% non-refundable deposit is paid and the painting is started. Regular updates are sent by email. I like to, when sending updates, explain my process and techniques to provide insight in the centuries’-old classical painting method I use. When complete, the painting is shipped or hand-delivered. I advise on and can arrange framing if required. Get in touch here to discuss your bespoke painting or to request a custom quote. 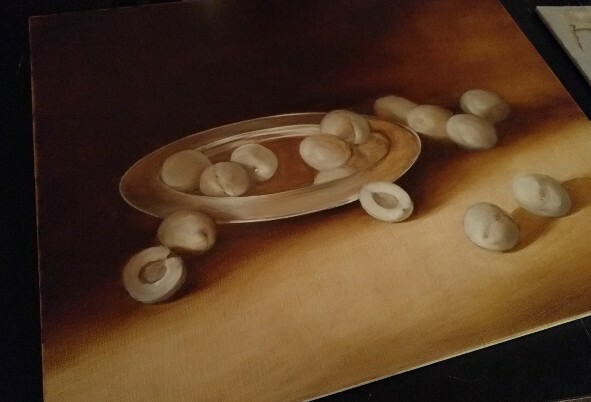 A commissioned painting in progress: establishing the underpainting layer in raw umber. Fine linen, 40cm x 50cm. Delft plate detail, fine linen 40cm x 50cm. 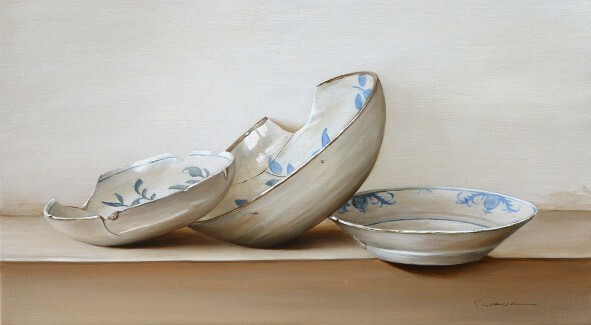 17th century Haarlem faience plates II, oil on fine linen, 26cm x 46cm.